A few weeks back my friend Yern (Joergen) VK2KJJ gave me a small plastic bag with a handful of electronic bits in it. It was a Pixie. It seems in this case a Pixie isn’t a small mythical person but a 7Mhz tiny transceiver with which you use Morse Code to communicate. I think these units are Chinese clones of a similarly small unit made in the States 10 years or so back. Now in the big scheme of transceivers, this one is at the most basic end. No bells and no whistles. 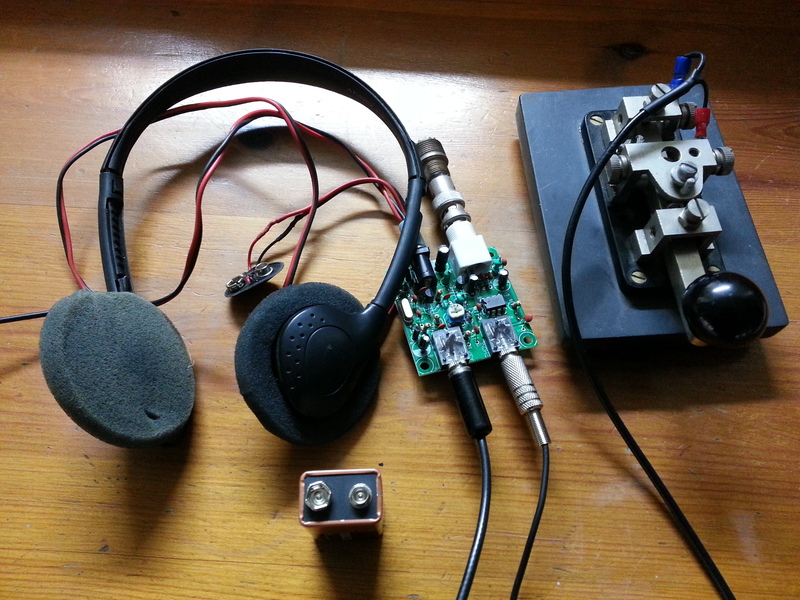 It runs off a 9v battery,requires headphones and as mentioned, a Morse Key…which is about 10 times heavier than the transceiver! Yern suggested we see who can get on air first with them – he bought a few of them and has even purchased some spares! (We raffled one off at a Radio Club meeting and raised $30.) I like a challenge like this and as the next few days were to be cold and good for spending in the shack without feeling guilty then what better way to spend than heating up the soldering iron, building up a kit and getting it on the air. It only took a few hours to complete and I plugged it in to my home antenna. For things to work first go for me is always a surprise and so I was suitably surprised and impressed when I could hear Morse Code coming through the headphones. Once the frequency was quiet I put out a call and back came Yern on the other side of town. I had been discussing the project on the local repeater with John VK2TH and he said he would take a listen for me so I put out a call. Further imagine my surprise, when back came Yern with a great signal. During the contact he congratulated me for getting on air first. My interest was now piqued. Could this little device be used to qualify a summit? In other words, could I take it out to a summit and make 4 contacts? I wanted to try. I studied my map of Womargama national park and found there are two summits in the south western corner. They are the 5th and 3rd highest in the Riverina association and fortuitously are relatively easy to get to – well by 4WD anyway. Bernard VK2IB confirmed this and indeed he was the first to qualify these two summits. My mind was made up – these two I would try to do and soon. I picked a day and asked Bernard if he wanted to join me but he declined as he wanted to do some other summits so he was a potential summit to summit contact. I asked Jeff VK2XD if he wanted to again join me and he jumped at the chance. I also again asked James VK2NKJ and he was also in but needed to be back in town by mid afternoon and so could do one summit. The date was the 7th June. Winter had well and really set in and despite a nice but cold day in town by the time we got into the park we we were in fog. Of course we had to introduce James to the delights of the Holbrook bakery so we were again “coffee-d and caked” before heading out. The drive through this part of the park was very pretty despite the fog and we were greeted at various times by wallabies bounding off either side of the track. Once at the top of the first summit which is not named and only known to us as VK2/RI-005 I quickly set up the station. Firstly, I put the Pixie on air but as expected there was quite a lot of Morse stations as there is a group that operate around that frequency every Sunday morning. So, sadly, I wasn’t going to qualify this summit with the Pixie. 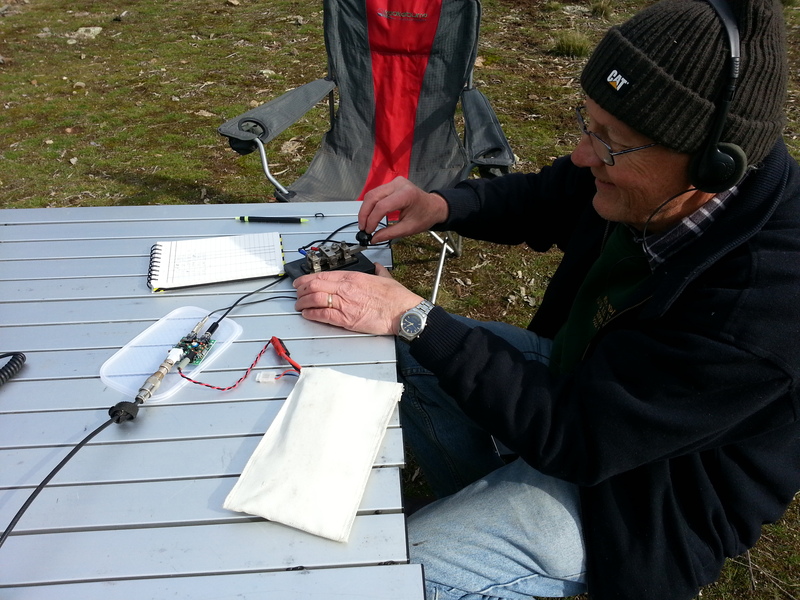 I put my trusty FT-817 on air and soon made the required contacts and handed the microphone to James for him to qualify the summit under his callsign. We finished up around 40 minutes later giving James enough time to head back to Wagga. 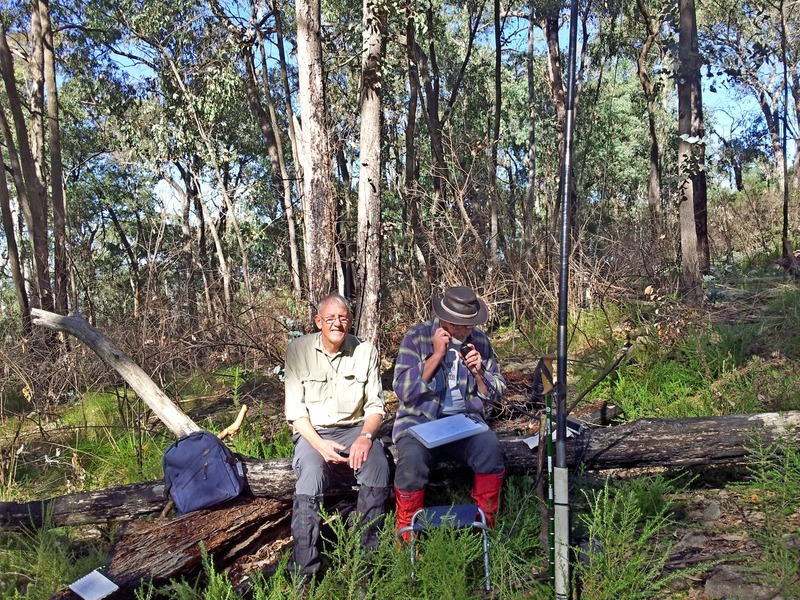 Jeff and I set off for Wagra Mountain (VK2/RI-003) the third highest summit in the Riverina association. It was pretty obvious no-one had been on the track for a long time as it was starting to get overgrown. I had forgotten to pack the chainsaw and was hoping upon hope there wasn’t any fallen trees. We did encounter a couple of small ones but nothing that even required stopping for. What we did find though was that the climb did require Low Range 4WD. This is quite a steep climb and I am sure the views would have been worthwhile but for the fog which didn’t lift all day. Wagra Mountain is the photo at the top of the page.We were pleasantly surprised that the summit opened out into a large clearing – large enough to turn the Troopy around. I only mention that in passing to give you an idea as to how big the clearing is as the Troopy’s turning circle is more akin to turning the Queen Mary around. So, plenty of room at the top. I set the antenna up using the squidpole as hanging it from a tree would have been difficult if I wanted to operate in the open. Before I got the Pixie out I checked for phone service and finding it adequate I sent a spot out to SOTA Watch indicating we were ready to operate and that I would be using Morse. I thought it best to do this to ensure someone was listening for my piddly little signal. Turned the gear on and sent out my first call. Moments later, Michael VK2CCW answered me. Michael is on the central coast near Budgewoi, a mere 480km! Wow! Next contact was with Alan VK7BO – even further at around 600km! Double Wow! 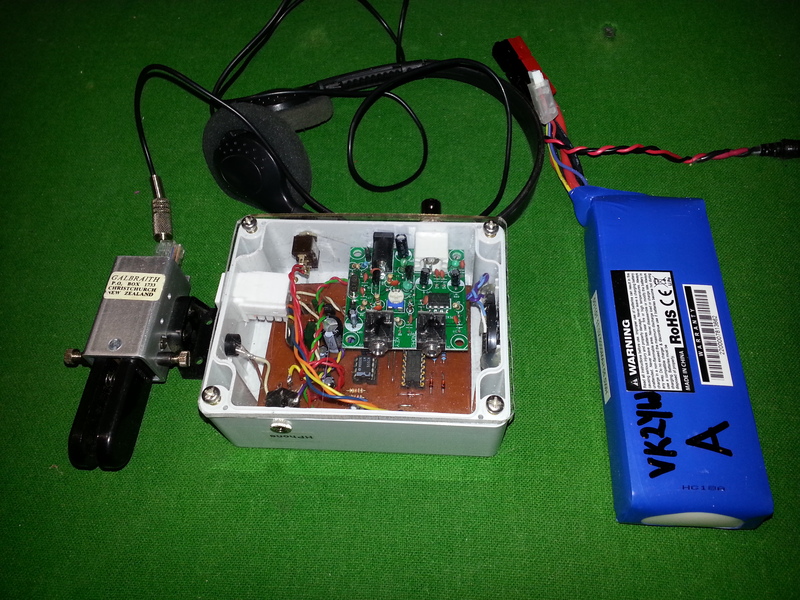 I think I was shaking – I couldn’t believe that this $6 transceiver was performing so well. I went on to make another 4 contacts including Bernard on his summit, Allen VK3HRA near Ballarat, Warren VK3BYD in Wangaratta and Garry VK2GAZ up in Richmond all giving me great signal reports. That exhausted the supply of Morse stations. Now it was out with the FT-817 and a change of mode and frequency and I completed the summit making 33 contacts in all including one to Slovenia on 14Mhz. Yes that’s right Slovenia…in Europe. I am just amazed at how far one can operate on quite low power let alone flea power from the Pixie. We headed off making a mental note to remind James that he missed the best part of the trip. James likes “off roading” and I am sure he hardly got into 4WD on the first part of the trip. After today, I am sure he will be wanting to get out and activate some summits himself. More wallabies on the way back and this time we made it back into Wagga before dark. Where to now? Well, I have had all sorts of thoughts on improvements to the Pixie. The first one I have already completed. The unit needed a box and I needed to ditch the traditional key – its just too heavy. So I went looking for a suitable circuit that would allow me to hear what I am sending – which the Pixie doesn’t do. The picture shows the result. But wait, there’s more. I ordered a second Pixie. Yes I let my head go and spent another $6. This time I want to see if I can make the Pixie change frequency and also be able to hear my sending. I think I can get all this into a small box as well. It should also be possible to carry a complete station in a couple of pockets and head off to a summit and activate it. This is minimalist SOTA and the thought really appeals to me. This entry was posted in Uncategorized on July 1, 2015 by vk2yw. If you have been reading my blogs so far you may remember that during my last outing I mentioned that just short of the vehicles on the return trip from Narra Narra I tripped over and when I got back to the vehicle I realised that I had lost my Leatherman. For those not familiar with the tool, its like a Swiss Army Knife and very handy. This particular Leatherman (I have two) was my retirement gift and so has a lot of sentimental value. So, as you can imagine, I was keen to return to try to find it and the sooner the better. Not only did I lose the Leatherman but I also lost the rubber cap off the top of the Squid pole (portable fibreglass mast). The following Sunday (May 24th) seemed ideal to return and search. Back home during the intervening week, I downloaded the track from my little Etrex GPS and loaded that into some excellent navigation software called Ozi Explorer. Using the software I could identify the exact place I fell over by both the rough position and that there was a distinct point in the track list where we clearly stopped for around a minute or so – that had to be the spot. I saved the newly edited track so it could be re-loaded back to the E-trex for use when I returned. I also to activate Mt Jergyle (VK2/RI-004), the summit we had run out of time on the weekend before as we had to cross it to get back to Mt Narra Narra.. Asking around during that week, I found that both Jeff and Bernard weren’t available so I invited Mike VK2DAI to join me. I told him he wouldn’t have to do any hill climbing and he would only need to follow me in around some 250 metres so it wouldn’t be a very physical trip. How wrong I was! The plan suited Mike right down to the ground and with the added promise of coffee and cake at Holbrook he was in! The proposed Sunday’s weather forecast looked perfect for both another activation and to return and try to find both lost items. The cap though was insignificant in as much as I could replace it from Bunnings at all of $5 – I wanted the Leatherman back. I had also asked James VK2NKJ to join in but to bring his 4WD as well. Its not that I didn’t want to tackle the area with only one 4WD but my vehicle only seats 2 and I felt I could use an extra pair of eyes, but, at the last minute, James had to pull out as he needed to do a rush trip to Brisbane. So that was it – just the two of us and we left Wagga around 8.30am on the Sunday morning. Weather was great and we were soon enjoying a coffee and some food at – you guessed it – the Holbrook Bakery. Stomachs full and coffee fix had we were soon underway to Womargama and then on to the national park and Mt Jergyle, which as I mentioned, we had to cross to get to the Leatherman site. Once on the summit, Mike was out to take some photos from the lookout while I threw the antenna up on a nearby tree and quickly assembled the station. I managed the first contact at a minute before 11am (0100 UTC) and went on to work 26 stations in the next 40 minutes. Then it was a quick pack up and then off to the foot of Narra Narra. With GPS and the track loaded, Mike and I set off on foot through the bush and were soon at the site of the fall. A thorough look around revealed the cap off the squid pole, not the Leatherman and so we headed back to the car for some lunch with a view to returning after lunch for another look. My guess is that the Leatherman fell off somewhere between the fall site and the road and that the fall managed to open my belt buckle. It was one of those plastic ones that you push on to release. I wouldn’t have noticed because my backpack is also around my hips and secured with a belt. Now as the undergrowth is quite thick in places it may take a lot of looking before we find it. Again, we retraced our footsteps and again we were not rewarded with any success. After a lot of looking Mike asked whether I had it still with me on the summit. Perhaps it came off before the fall. He suggested we look back further and so off we set. Before I knew it we were again climbing, all the while searching. The track we were now retracing though was the track Bernard and I had used the weekend before. Instead of following the ridge line back down, Bernard and I had decided to follow the old road which we did until we lost it. This old road went almost straight down from the summit and would have been quite a challenging drive back when it was put in let alone today with a modern a modern vehicle where it would have still been a challenging drive. But now, Mike and I were retracing that route and it was getting very steep. After numerous stops to catch our breath we found ourselves close to the summit. I was out in front by some 30 or more metres when I heard a yell. “Are you alright?” I called. Mike had grabbed a small sapling to pull himself up when it came right out of the ground which in turn sent him rolling back down the slope by about another 20metres. At this stage there were various thoughts flashing through my mind like, I have no radio, a phone that might or might not have any signal, no water or first aid kit let alone any shelter. Hell, I hope he is OK. I went back to him and he was back on his feet but complaining of sore ribs. Back in September the year before, Mike had fallen from a ladder and had broken ribs and collar bone so it was likely he had again broken a rib. We were now close to the top and level ground so with some difficulty we finished the climb. In the back of my mind, I am still thinking about Medivac. However, Mike assured me all was OK and he could make it back down. My mind now turned to the reason for climbing and I set about searching where I had been the weekend before but again, to no avail. The afternoon was now slipping away fast and we needed to get back to the vehicle so with Mike nursing some sore ribs we set off – this time taking the gentler ridge line route until we could again swing back to the fall site for one last look. Again, no success. It seems the Leatherman is destined to remain hidden for at least the rest of winter as some of the Womargama trails will be dodgy to say the least after prolonged wet weather. Well the day was not wasted with one activation and the retrieval of the squid pole top so all not lost and of course it will be an excuse to return in spring, with a few more eyes and perhaps the metal detector. Who knows, I might yet find it. As I write this some 6 weeks later Mike seems to have recovered. Whether he will return with me or not remains to be seen. I suppose I can promise that other than a short walk into the bush, we most definitely wont be doing the climb again. I will leave that to the next time I activate that summit. Two ‘Uniques’ – one day! These mountains are in an area reasonably close to home and with which as an area I am fast becoming enamored with. This is Womargama National Park. The park is located just to the east of the tiny village of Womargama which up until the Hume highway was duplicated actually ran through the village. It is situated to the north of Albury by about 40km and just south of Holbrook – famous for its very large submarine. Did I mention they have a great bakery? Anyway back to the national park. To the south is the Murray river and the park extends about 30km from west to east and 15km north to south. It measures in size at around 240 sq km and is the largest protected area of forest west of the Great Dividing Range. It is also home to nine SOTA peaks – some relatively close to the road and others, well, let’s say they are a little more remote. In the past I have driven up Mt Jingellic and have walked up Mt Tipperary – both of which are in the park so completing just two today means I am nearly half way through. We could not have planned for better weather. It was a perfect late autumn day although we struck some quite thick fog as we entered the park but that soon burnt off revealing a clear blue sky. Jeff VK2XD and myself left Wagga just after 7am and arrived at the southern Holbrook bakery at about 8am where we managed a coffee and bun while we waited for Bernard to arrive. Once he had downed his coffee we set off down the Jingellic road and were soon in the park. Finding the first starting point was easy – I counted 4 GPS systems in my vehicle alone – navigation items we were not short of! The first summit was an as yet unnamed mountain known on the database as VK2/RI-008 at 827m ASL. We both found suitable places to pull off Tin Mines Trail and then put our packs on, set the GPS course and off we went. According to my GPS that was at 10.20am and from 627m ASL. The going soon got quite tough with a lot of quite thick, low vegetation which quickly reduced both visibility and our speed. Navigating in this country with just map and compass would be OK but would take a lot more concentration. With a small GPS such as my Etrex-10 it becomes much easier, allowing more concentration on where your next step will be made. Of course you are going up hill so its difficult to stray too far from the objective :-). We arrived in the activation zone (an area within 25 vertical metres of the actual summit) where we found a suitable clearing to erect antennas. Operating from the actual top of the peak looked to be very difficult with no openings in the tree canopy and a lot of thick undergrowth. The radio plan was to run two stations simultaneously with Bernard trying for 52Mhz and 28Mhz to gain points in this year’s challenge. I activated my station on 7Mhz and soon had more than enough contacts to gain the activation points. Bernard on the other hand could only raise one contact on 28Mhz and came over to operate my station to gain the rest of his required contacts. It had taken us 40 minutes to do the climb plus a further hour of operating making it now after noon. We were already now an hour behind our main plan and not back at the vehicles. The descent took around much the same time as it took to climb which should give you some idea how steep it was. As soon as we had finished lunch it was back in the vehicles and off to VK2/RI-007. This summit seems to have two names – Mt Pleasant and Narra Narra. This summit is about 10km west of the first one and is higher at 862m ASL. It is visible in the sunset photo at the top. We found suitable parking spots for the vehicles and again loaded up. Jeff decided to sit this one out so Bernard and I set off together at about 10 past 2. It soon became apparent to me that the undergrowth was much thicker and the climb much steeper taking almost a full hour. From a physical point of view this was a very hard climb and we were both puffing and sweating profusely by the time we reached the top having to take numerous stops to catch our breath. There was an Edmond Hilary moment when we got to the top! The undergrowth was fairly sparse on the summit although not a lot of clear space through the tree canopy. We set up the station very close to the Trig point and because we were now well behind time Bernard and I decided to operate one station and just do 7Mhz. Being late in the afternoon there wasn’t the number of chasers we had in the morning so once we had exhausted the supply it was pack up time and soon we were heading back down. Once we got to the top I was pretty sure we had crossed a very old formed track. I was keen to try to follow it on the way back. It would have been a great 4wd trip in its day as it literally goes straight up and we guess from the small amount of dated graffiti on the trig point that this track might have been made in the early 1970’s when a new trig point was erected. From the stone evidence lying around, I imagine the track was made to take the new trig point and the workers up to the top. After about 500m of descent it was impossible to see where the track went and so we continued on making our way now back as close as we could to our ascent track. Now if you had read some of my previous blogs you may remember I am prone to falling over on these treks. But for some reason I had not taken a tumble at all on this trip, that is until about 250m short of the vehicles I managed to fall over two largish sticks that just happened to be crossed in such a way that they held my left foot tight and down I went. That was ok, the ground was soft and broke my fall so I was soon up and away again. It wasn’t until I got back I discovered I had lost my beloved Leatherman multi tool from my belt. My guess is that when I fell, the buckle on my pant’s belt came apart allowing the tool to fall off. Examination of the GPS track indicates exactly where that point was so I am going to return shortly to see if I can find it. My chances are good and it may be a chance to activate the summit we missed. The descent was a good 40 minutes and we got back to the vehicles at around 10 to 5 with the light now starting to fade. We headed off and stopped up at North’s Lookout on Mt Jergyle for some photos of the sunset and then back in the cars to head for home. This is VK2/RI-004 – the summit we were going to miss this time and is the image at the top of the blog. We still had a further 12km or so before we were back on bitumen and so the majority of this part of the trip was done in the dark. Aside from one wallaby I was very pleased and relieved that I didn’t see any other wild life on the way out. We arrived back in Wagga Wagga around 7pm, making it a long but very rewarding day. After doing my logs I find I am now some 947 points short of my Mountain Goat award having added just 8 points for today’s effort. I think I am going to be a long time in the making of ‘Goathood’!